How to create a Generation Z-friendly app. Reach the next target! Home » Mobile App Development » How to develop a Generation Z-friendly app. Reach your next target! Are you developing an app and wondering if it is innovative enough to reach the new Generation Z? Here, you will find some tips to make sure you are reaching your future target audience. Capt their attention and keep them hooked on your app! Generation Z: get to know your audience. First of all, it is necessary to specify what Generation Z is. This cluster of consumers is usually referred to as youngsters born between 1995 and 2010. Generation Z has been taking over the so-called Millennials. In fact, according to the latest research carried out by Bloomberg, this new generation is believed to represent 32% of the global population within 2019. This data becomes quite relevant when it comes to plan your strategy and start developing your new app. As a point of fact, due to the several differences that distinguish the Generation Z from the Millennials, some changes to your current strategy should be applied. However, before developing your plan you must be aware of the preferences, behaviour, and requirements of the Gen Z. 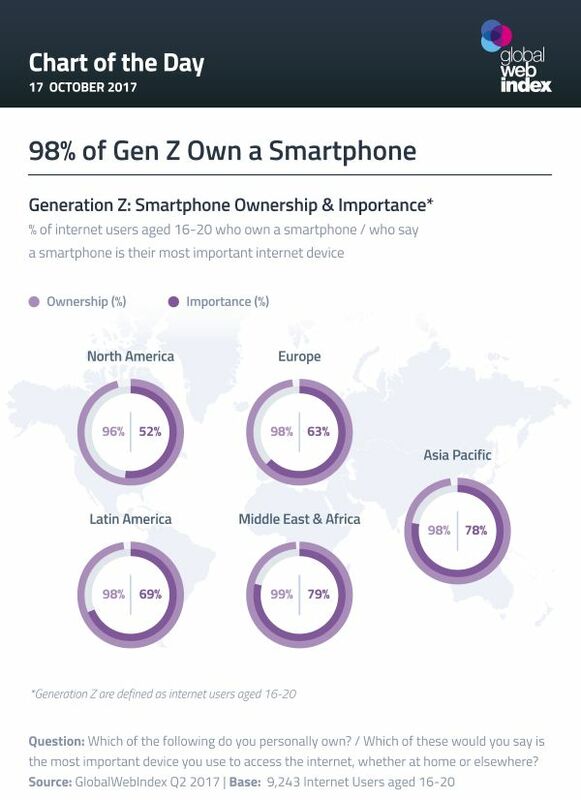 They represent the so-called “Mobile generation”: According to a recent estimation brought up by Global Web Index, about 96% of Generation Z own a smartphone. They were introduced to mobile phone devices and technology ever since they were born and grew up with them. In addition, most of them navigate for at least 1 hour daily, and about half of them spend more than 10 hours on the web. They are not well-known for patience. They do want speed: It has been measured that the attention span of Gen Z’s corresponds only to 8 seconds. In other words, their low attention span does not allow either long loading times nor broken items on the app. In case this occurs, the most likely scenario would be the user uninstalling the app immediately. Teens communicate with each other through visual elements: emoticons, images, and symbols. Even though they send and receive a high number of texts a day, their content is mostly represented by emojis, gifs, stickers, abbreviations, and images. As a result, communication and entertainment might be often overlapping. Text appears to be underestimated to the extent that they are not even interested to keep a record of their conversations. For instance, Snapchat and Instagram Stories (pictures disappearing after 24 hours) are widely used among the Generation Z. Make your app “social”: Gen Z feel the need of interacting constantly with one another online. Hence, developing in-app communication could be the best way to allow them to stay connected with their network without leaving the app. The Nav Bar: The platform ought to be easy to use so that they can start using the app without the need of instructions nor guides. With this purpose, the navigation bar should present familiar layouts and buttons. Usability: If actions are out of hand or functions are hard to find because of complex menus, they won’t give another chance to your app. Remember: It is fast to get to the app store and download another app! Graphics: Play on the visual items and bring UX to another level. Use appealing animations and transitions, avoid obscure icons and engage them with a catchy and colourful design. Make sure your message is easily understandable and able to grab their attention. In a nutshell: make their experience simple, intuitive and visual! Fix the bugs! Ensure the best experience not only by offering a simple interface but also by enabling a fluid navigation through the app. Namely, fix the bugs and keep the app monitored on a regular basis to maintain it bugs-free. Focus on improving your app and code quality and … test it! Keep it light! One of the first things you should consider is the size of your app. Teens take, share and receive tons of photos and videos every day. It appears to be quite simple to run out of storage. Hence, try to limit the size of your app to avoid the users to delete it due to a lack of memory. Research shows that one of the main causes of app uninstalling is the excessive weight in terms of Mb that the app has. “Exploit” your audience: Gen Z seems to appreciate promotions, discounts, and free contents. In order to offer these options and make it beneficial for both sides, offer the option to bring contacts to the app by sharing invitation codes. This will foster your user base and increase your brand awareness. Additionally, Gen Z users can be utilised as a leverage for word-of-mouth marketing and advocating your app. They are also likely to leave reviews. Therefore, once you are sure your app is ready and efficient enough, you should integrate it with social platforms. This may help to foster the release of positive comments and increase your credibility along with the downloads. Thanks to this article, you should now be more aware of who the Generation Z is and its main features. Thus, you can start developing your app accordingly. Make the best use of our tips and remember to monitor the app performance to test its functioning on a regular basis.